Cambodia's great Tonle Sap Lake sits only 15 km south of town, a unique eco-system and cultural area offering the opportunity to see a different side of the Siem Reap - floating villages, cultural and nature tours, birdwatching... Basic boat tours can be arranged at the Chong Khneas boat dock but we recommend arranging your tour through a reputable tour operator in Siem Reap. 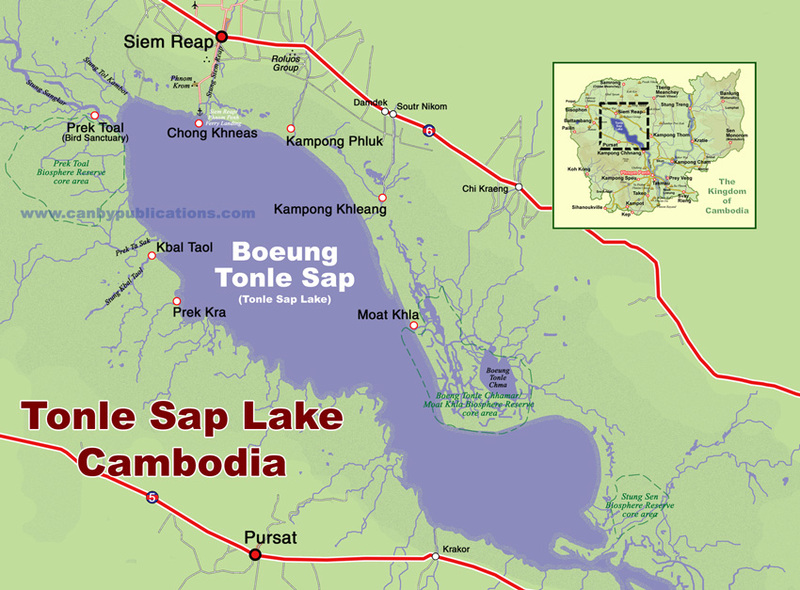 The Tonle Sap Lake is the most prominent feature on the map of Cambodia - a huge dumbbell-shaped body of water stretching across the northwest of the country. In the wet season, the lake is one of the largest freshwater lakes in Asia, swelling to an expansive 12,000 km2. 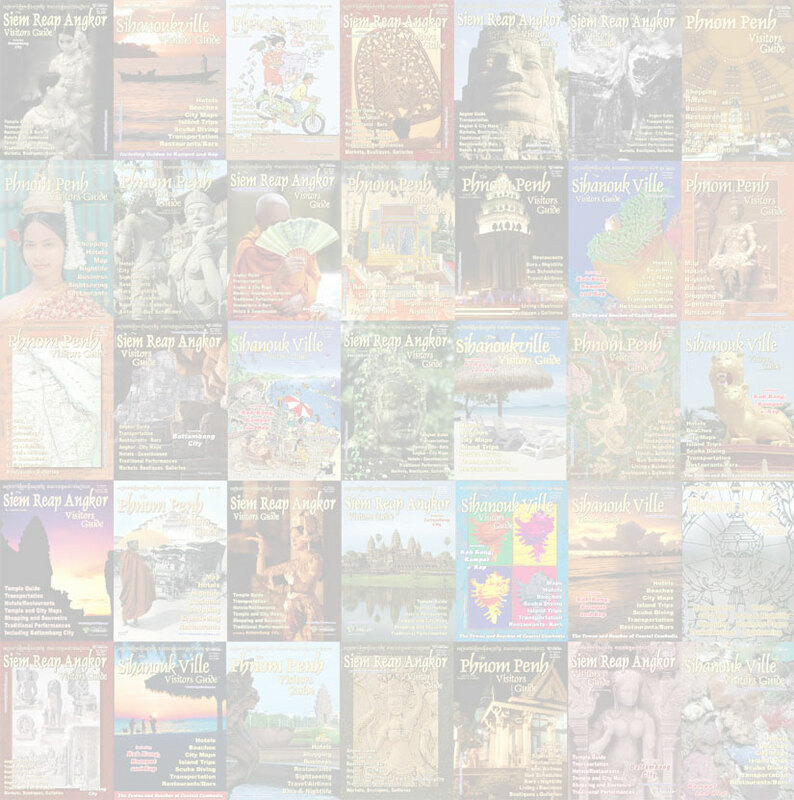 During the dry half of the year it shrinks to as small as 2500 km2, draining into the Tonle Sap River, which meanders southeast, eventually merging with the Mekong River at the 'chaktomuk' confluence at Phnom Penh. During the wet season a unique hydrologic phenomenon causes the Tonle Sap River to reverse direction, filling the lake. The engine of this phenomenon is the Mekong River, which becomes bloated with snow melt and runoff from the monsoon rains. The swollen Mekong backs up into the Tonle Sap at the point where the rivers meet at Chaktomuk, forcing the waters of the Tonle Sap River back into the lake. The inflow expands the area of lake more than five-fold, inundating the surrounding forested floodplain and supporting an extraordinarily rich and diverse eco-system. More than 100 varieties of waterbirds including several threatened and endangered species, over 200 species of fish, as well as crocodiles, turtles, macaques, otter and other wildlife inhabit the inundated mangrove forests. The Lake is also an important commercial resource, providing more than half of the fish consumed in Cambodia. In harmony with the specialized ecosystems, the human occupations at the edges of the lake is similarly distinctive - floating villages, towering stilted houses, huge fish traps, and an economy and way of life deeply intertwined with the lake, the fish, the wildlife and the cycles of rising and falling waters.